Deeply touched by your work ! Felt as though I was sitting across the table from Annie, while she spilt her drink on papers she couldn't possibly replace. What a feeling it put in the pit of my stomach to think that it might all be lost, especially after what it took to acquire them in the first place. I’ll See You in Paris by Michelle Gable starts in 2001 in Virginia. Laurel Haley is a going to Banbury, England to sell a home she owns (her daughter did not even know she owned a home in England). Her daughter, Annabelle aka Annie is going with her. Laurel has always refused to discuss her past with Annie. Nor will she discuss Annie’s biological father. Before they leave for the airport, Annie notices an old, blue book of her mothers. Annie picks it up and brings it along with her (but lies to everyone about it). When Annie goes to a pub, an older gentleman, Gus who recognizes the book. Annie gets information from him and also does a little investigating (and trespassing). Annie slowly unravels the mystery as well as her mother’s past (it was an odd book). I'll See You in Paris is an extremely difficult book to read. It is written in a confusing format that makes the reader want to give up by the end of the third chapter (this is where I wanted to chuck the book across the room). I just did not like the story or the characters. The novel does contain foul language (and it was not needed). 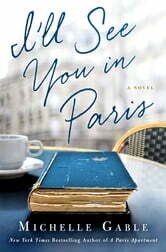 The only thing I liked about I'll See You in Paris is the cover (which is what attracted me to the book). It is only in the last twenty percent of the book does the story start to come together. However, the ending was disappointing. I give I’ll See You in Paris 1 out of 5 stars. I received a complimentary copy of I’ll See You in Paris from NetGalley in exchange for an honest evaluation of the book! Good read and good to know it was based on a real person - am looking forward to looking up more about Gladys Deacon. An interesting story packed with wonderful characters. A good story line that holds your interest and tidies everything up in the end. Wonderful story full of suspense, humor, love and joy.